YES YES YES! Fifee the Chameleon is coming back. The new evolution of Fifee is here. Last year Nuttun Santhong aka Nothing Jingle Bells brought us the ever so cute “Fifee The Chameleon” collectable figure. 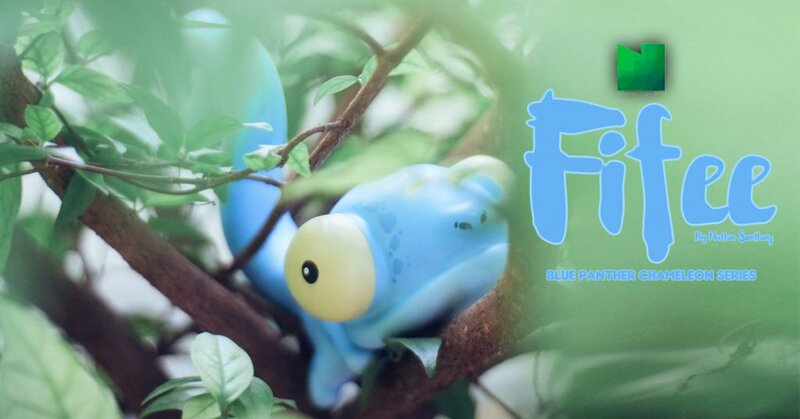 A few hours ago the next evolution began with Fifee shedding his skin for a new Fifee Blue Panther. Like we said last year, “when you thought Pascal from Disney’s Tangled was the cutest and most adorable, Nuttun Santhong aka Nothing Jingle Bells does one better” those HUGE eyes on Fifee the chameleon caught our attention when Nuttun showcased Fifee at Thailands ATM2 which you can check out HERE. Guess now we will have to adopt another Fifee to keep our OG edition company. Start to Pre Oder At 7 pm. Thailand Time. 19th JULY 2018″ via Facebook page HERE. If you interesting please comment in Pre-Order post only. Nothing Jingle Bells will contact back to you when close to order. Find Nuttun on Instagram and Facebook.